In 1993 Neil Spector,then an oncologist and cancer researcher at an institution elsewhere, found his life spiraling downward – once the picture of health, he began to experience debilitating symptoms, including cardiac arrhythmias, excruciating fatigue and joint pain. After several tests proved inconclusive, Spector’s doctor told him stress was to blame. Convinced otherwise, Spector spent the next several years battling the medical system in a quest to get to the heart of the matter. In the meantime, without a diagnosis or a cure, the condition of his heart rapidly deteriorated. Although in 1997 Spector finally received a medical diagnosis, it was far too late for his broken heart. He had just 10 percent heart function – a frightening condition he would negotiate every day of his life for the next 11 years. In 2009, after a series of life-threatening complications, Spector had no other choice but to undergo a heart transplant. Now, just in time for Valentine’s Day, Spector shares his harrowing and heartfelt story in his memoir, Gone with A Heartbeat: A Physician’s Search For True Healing. 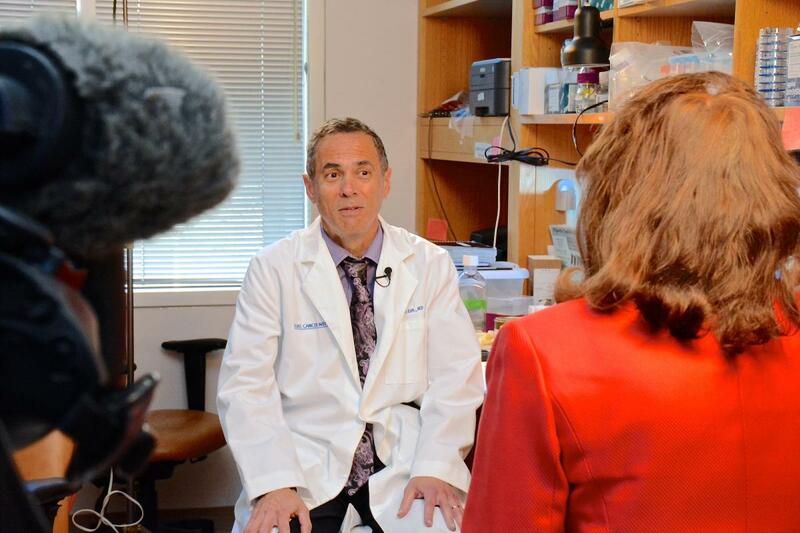 Neil Spector, MD, a physician-scientist with the DCI, recently interviewed with UNC-TV to share his work as a breast cancer researcher. He will be featured as one of several panelists in an upcoming program, “Cancer: Focus On Life,” to be aired on UNC-TV on Wednesday, April 1. Spector’s memoir, Gone In A Heartbeat: A Physician’s Search For True Healing, was released in early February. Gone In A Heartbeat: A Physician’s Search For True Healing is now available online at Amazon. Spector’s memoir can also be purchased at fine bookstores everywhere, including the Duke Medical Bookstore, located in the Red Zone of Duke South. Circle photo: Neil Spector, MD, and his wife, Denise Spector, PhD, pose with Neil's book, Gone In A Heartbeat. "Neil's story is inspiring and powerful," Denise says. "I believe the process of writing the book has been very therapeutic for him. Having learned much from his personal health journey, Neil hopes to help others advocate for their own health."